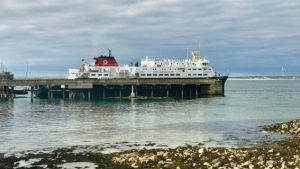 The Rural Economy and Connectivity Committee (REC) chose earlier this year to carry out pre-budget scrutiny on the strategic investment required to support Clyde and Hebrides Ferry Services (CHFS). • Calls on the Scottish Government to respond to criticisms of the lack of resilience in the fleet and to the evidence that CMAL has received less than half the amount of funding required over the last 10 years. • In anticipation of the budget publication in December, the Committee recommends that the Scottish Government prioritise ferries investment with a focus on procuring new vessels to reduce the average age across the fleet and improve service reliability. • In conjunction with this budget prioritisation the Committee calls on the Scottish Government to conduct an urgent review of the Ferries Plan to meet current and future needs. The islands must be served by a network of routes that fully meet the needs and aims to meet the aspirations of communities and encourage their long-term sustainability. The Committee considers it to be imperative that these proposals are underpinned by a fully co-ordinated strategy for the staged, ongoing replacement or refurbishment of vessels and any necessary work to upgrade ports infrastructure. It is essential that the strategy is supported by a delivery plan that includes a realistic and achievable programme of funding, which will give confidence to island communities and other ferry users. This ongoing programme of funding should be clearly reflected in all future Scottish Government budgets. • As part of this review, the Committee recommends that the Scottish Government reflect on whether it may be more appropriate to procure a larger number of smaller vessels as opposed to larger, more expensive vessels, to meet future needs on certain routes. Although, it notes suggestions made in evidence that larger vessels may be more environmentally friendly and require a lower number of crew members across the service. • The Committee recommends that the review should consider provision across the whole network with a focus on removing bottlenecks to each island community. Consideration should be given to identifying the islands where capacity is particularly constrained across a full operating day. • Asks for further clarity on how the berthing dues which CalMac pays to Trust, local authority or privately-owned ports are used. It asks the Scottish Government whether it would be possible for any requirement to be placed on these organisations to invest a proportion of those dues in harbour maintenance and investment. • Where port infrastructure works are required the Committee recommends that the Scottish government work with all harbour owners to encourage a standardisation of ferry berthing points to allow greater flexibility in the network and allow a wider number of vessels to access ports. • Recommends that the Scottish Government reflect on the evidence the Committee has received about ways in which RET may be further improved and developed in future. For example, differential or dynamic pricing and the ability for islanders to take priority, particularly in emergency situations. This evidence should be taken into account as part of the 2019 RET review. • Notes the record number of visitors to the islands and calls for the Scottish Government’s views on ways in which the existing fleet and any additional resources might be used more flexibly and creatively to deal with freight and commercial business and alleviate pressure on regular passenger sailings. • Recommends that the Scottish Government review the procurement practice of ferry tendering in countries where state aid rules apply but they appear to be able to achieve a greater degree of flexibility and innovation to see what learning can be applied in Scotland. • Seeks confirmation from the Scottish Government on whether it intends to complete an Islands Impact Assessment on this year’s budget. • Notes that the islands, like the rest of Scotland, have an aging population. It is essential that any new Ferries Plan and investment strategy take the changing needs and demographics of the islands into account. what will be taken forward as a result of the exercise and any mitigating actions that will be taken if the action which the community calls for is unable to be delivered. • Believes that better transport integration should be prioritised as part of any future investment strategy as it would contribute to the achievement of a number of environmental, socio economic, accessibility and funding objectives. This entry was posted in Transport Forum on November 9, 2018 by AdminTCC.